Thank goodness, cool fall weather has finally come to us in North Texas. No sweaters yet, but at least the air conditioner is off. It is just delightful to be outside at any time of the day. AND I can drive now. I have to switch from my walking boot to a tennis shoe while I drive, but hey, it's worth it. I can search out little white pumpkins and greenery whenever I want to. 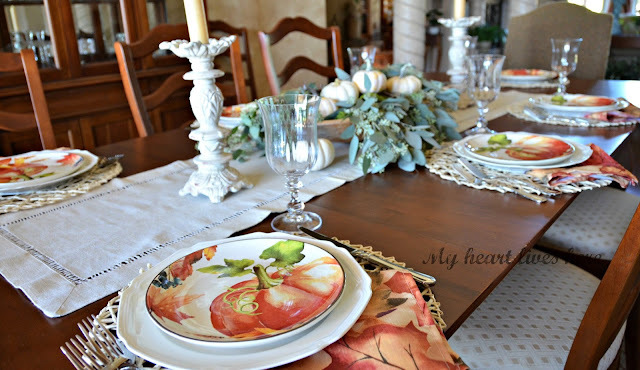 I'm so glad that Shannon of Belle Bleu Interiors shared her source for these pumpkin salad plates. Can you believe they are from Walmart?! I found one in a store and then ordered a six pack of them. So, one person will have a coordinating leaf plate until I track one more pumpkin down. Or maybe I'll order another box of six. They're awful cute. Thank you, Judith. I am like a sixteen year old with a new driver's license! I wanted to buy a whole set of those plates when I saw them at Walmart! They are so pretty. I settled on one to use as decoration. (I'd just bought plates from Pier 1, sigh). So glad you are driving finally! Woohoo! And isn't this weather the best? Absolutely love those salad plates! 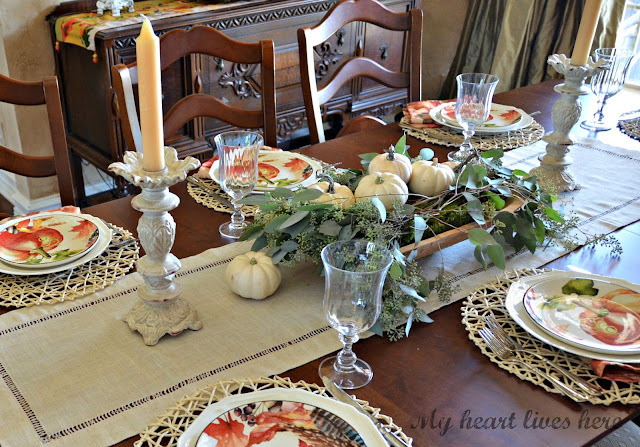 Eilis, your table looks so beautiful with those pumpkin plates! 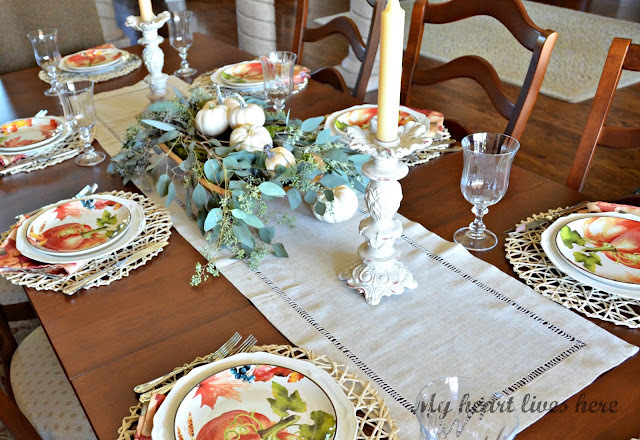 I love your placemats with them...how pretty! Your centerpiece is gorgeous with the greenery and white pumpkins. I'm so happy that your ankle is doing so much better. It is great that you are able to drive. It is so hard on a girl when she can't go shopping! I hope that you are having a wonderful weekend!!! You scored with these plates! I LOVE them. 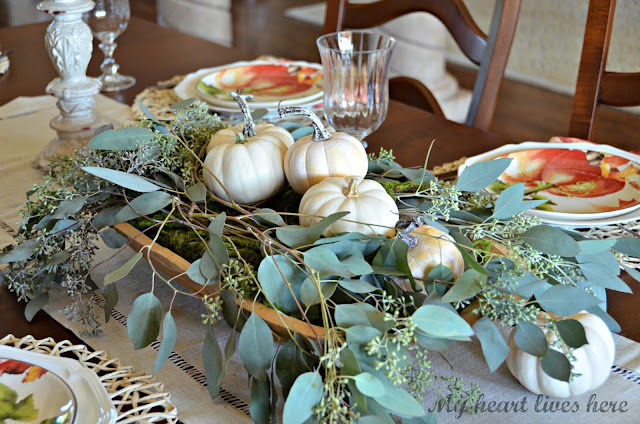 Beautiful table-setting and the centerpiece is just gorgeous! What a lovely table setting. I love the plates from Walmart. 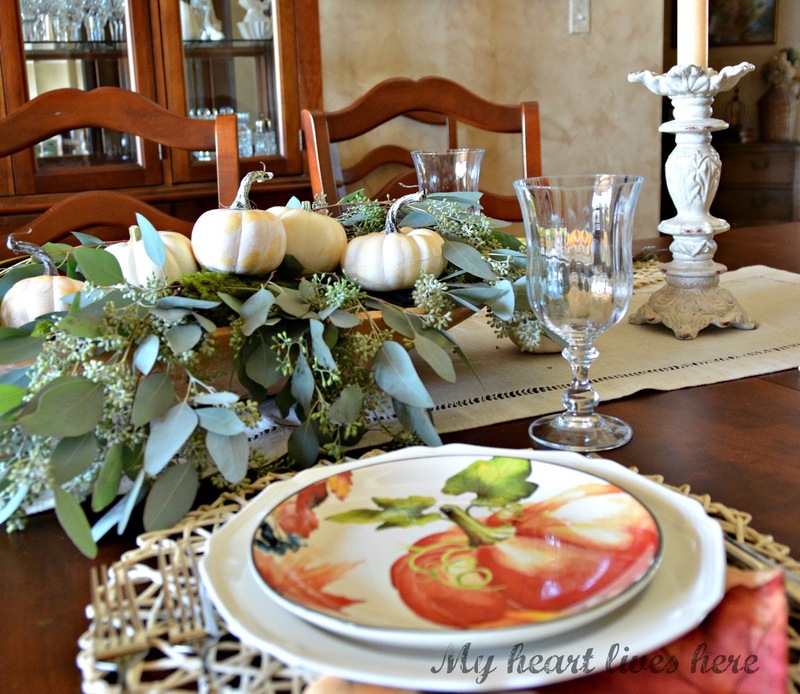 I bought fall plates from Walmart several years ago and love them. Glad you are able to drive now! What a score from Walmart. 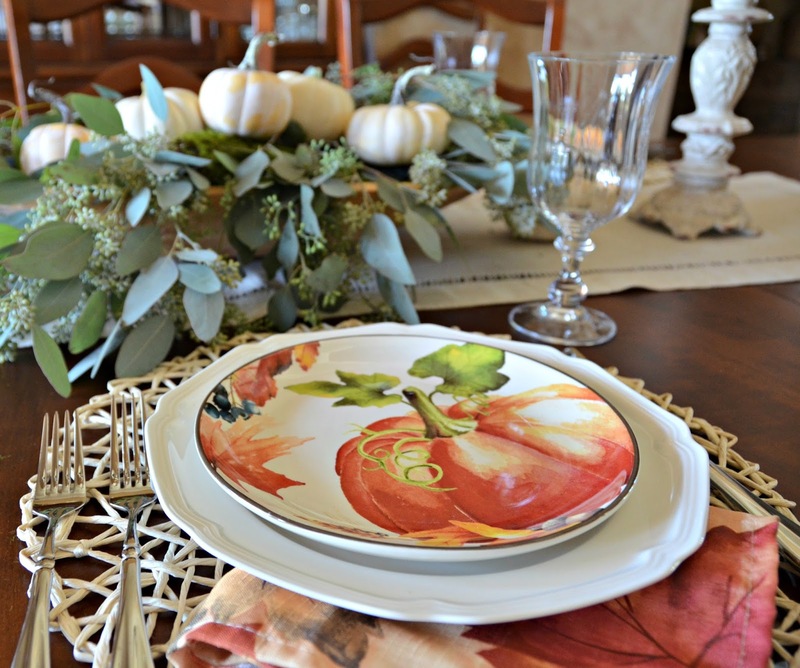 The plates are perfect for fall and would carry clear into Thanksgiving. Hmmmm, may need to order some. :) Thanks for sharing with SYC. Looking forward to you gals fall tour.